What happened to my danios tail? So my leopard long fin danio had a tail yesterday, today he did not! Just a nub and tattered looking flesh. All my fish are peaceful, only one that could be considered aggressive at all would be pair of Kribs. 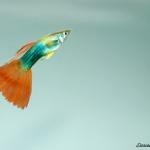 Had them for a while and they never hurt any other fish, lyre tail guppies, endlers, nothing. So what gives? If they're spawning than its no more Mr nice kribs..
Yeah I know, just don't know if they are spawning. Is there a disease that rots tails that quickly? I just bought them about a week ago. It could be inner species related, developing a hierarchy. .
+1 danios can be a bit nippy especially when it comes to long flowing fins, is he the only one with long fins? Have you noticed the others missing bits of fin here and there? If not there may be something wrong. Is the tail gone all the way to the base, does it show any discoloration or inflammation? Now I notice that my dwarf rainbow, which is much larger than the danios, has a weird white looking bald spot on top of its head, not an ich spot, way too big to be an ich spot. What is going on?